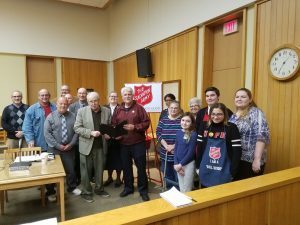 Mayor Ronald Woodward Sr. and members of the Fulton Common Council present volunteers from Salvation Army and the Thanksgiving Community Dinner with two mayoral proclamations. FULTON, NY – The City of Fulton has made two Mayoral Proclamations to get in the spirit of giving this holiday season. Mayor Ronald Woodward Sr. has declared Community Thanksgiving Dinner Day as well as Salvation Army Christmas Kettle Fund Drive Season in the city of Fulton. This Thanksgiving day (Thursday, November 22) the city of Fulton has proclaimed as Community Thanksgiving Dinner Day, of which a free meal will be provided to anyone in need of a place to eat for the holiday. 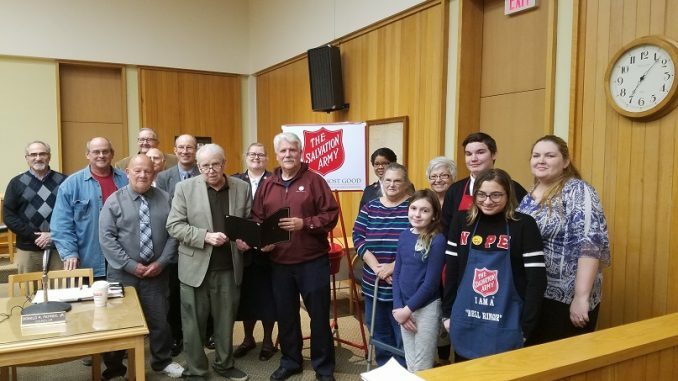 “For the thirteenth year, First United Church of Fulton, Prince of Peace Lutheran Church, State Street United Methodist Church, and Oswego County Salvation Army, have joined forces with local businesses and agencies to create a Community Thanksgiving Dinner,” the proclamation read. The dinner will serve up to 300 people in need of a holiday meal as this time of the year can be especially difficult for those experiencing financial hardship or that live alone, the proclamation said. Volunteers will make and serve dinners from 12 p.m. until 2 p.m. at the First United Church of Fulton, 33 South Third Street. For more than a month, the Oswego County Salvation Army will offer opportunities to give back this holiday season as well. Beginning November 14 and running through December 24, the city of Fulton has declared the Oswego County Salvation Army Christmas Kettle Fund Drive Season for 2018. Having been in existence for 100 years, the mission of the Salvation Army is “to meet human needs without discrimination,” the proclamation read. The Christmas Kettle Fund Drive is a yearly fundraiser in which volunteers take donations in the iconic Salvation Army red kettle buckets in an effort to help local families and individuals. The Oswego County Salvation Army hopes to raise $70,000 this season. “All funds raised will be reinvested into the Oswego County Community to provide food and clothing for those in need, operate the food pantry and soup kitchen, and distribute monthly food boxes, provide breakfast and lunch Monday through Friday and for operating expenses,” the proclamation detailed.